September | 2018 | Mothers Against Wind Turbines Inc.
Too good to be true? The newly elected Ontario Government lead by Premier Ford has announced it is repealing the Green Energy Act (GEA). At first flush this should be a good thing and cause for tremendous celebration for wind warriors opposed to the harmful impacts of wind powered complexes especially for those families and individuals who have been raising alarms about adverse health impacts. The GEA is the statute that has enabled renewable energy projects in Ontario to be built, operated and home for regulatory capture under prescribed regulations. But…. Is the announced Bill 34 an elaborate switch and bait hiding the powers of the disastrous Green Energy Act in another statute? Careful reading of the bill is generating the realization that moving the meat and potatoes of the GEA into another law doesn’t remedy all what is wrong with renewable energy projects powered by wind. It is enough to have a mother take to drink. Anyone got a buck for a beer? A tornado touched down September 21, 2018 in Ontario. Photos are of the funnel cloud with industrial wind turbines looming on the skyline. Damage was extensive where the tornado’s force made contact. This extreme weather event has not generated any reports of turbine component liberations. The decisions you make will affect my life and the lives of my children and grandchildren, so I feel compelled to bring several things to your attention. Many people are aware that the Ontario provincial debt is $332 billion dollars. Nearly 90% of Ontario’s net public debt has been accumulated in the last 25 years – a level of increase that is unsustainable. (1) Never in the history of Canada has one generation down loaded so much debt on the next generation! Our children may be too young to vote, or not as well organized as lobby groups such as seniors, the wealthy or various business interests but they are our future decision makers. Interest payments on the provincial debt are $12 billion dollars per year leaving less money available for infrastructure, health care, education, tax relief and other social needs. We are living beyond our means and mandatory balanced budgets should be required by all levels of government. As the Ontario government you can increase taxes, increase borrowing or sell off public assets. If you do not want to reduce services or increase taxes you are going to have to eliminate any spending that is “not fit for purpose”. The biggest waste of taxpayer’s money occurs when government initiatives are not based on any cost benefit analysis. For example – no cost benefit analysis was ever conducted regarding the cost of the Ontario renewable energy initiative. So the Ontario government has been aware of the poor performance of wind and solar electricity generators since 2010, but has continued to add wind and solar to the energy mix. Everyone wants clean, green, cheap energy, but that is not what we are getting. We are getting an unreliable, intermittent, expensive energy system that actually increases CO2 emissions because we have to use gas plants to back up industrial wind turbines and solar panels. Blades and solar panels are non-recyclable so will have to be disposed of as toxic waste! The four major forms of renewable energy considered in 2011 were hydro, wind, solar, and bioenergy. When you consider the output by generator type in 2017 the production from wind for Jan – Dec 31, 2017 was 765 MW/hr from a name plate capacity of 4,213 MW. A dismal performance with 18% production from the installed nameplate capacity. The difference is explained as an “allowance for capability levels below rated installed capacity.” Considerable distortion exists in the presentation of material when a product has an 80% drop in production over the stated manufacturer nameplate capacity. This is like telling me that my new car is capable of 1000 km on a tank of gasoline and instead it goes 200 km! Hydro – a baseload renewable energy source – produced 3143 MW of power per hour from Jan – Dec 2017 from a potential of 5786 MW. So, we are only using 54% of the potential production from our cleanest, greenest, cheapest energy source. Only ten percent of our power is produced from wind, solar and natural gas – made possible by underutilizing our hydro power generation. The total cost for wind energy in 2017 was upwards of $1.5 billion dollars plus solar at $1.5 billion dollars plus natural gas at $2 billion dollars for a total of $5 billion dollars! The transfer of wealth from the ratepayers of Ontario to the private for-profit multi-nationals for unreliable, intermittent energy cannot continue. The sad reality for the ratepayers of Ontario is that the hydro plants could easily have been ramped up an additional 850 MW per hour to cover the contribution of wind, solar and biofuels. Instead we ran the water over the dam. We also negotiated a $1 billion-dollar deal to purchase hydro electricity from Quebec while we run our water over Niagara Falls! The waste of our renewable resources, duplication of energy generation and payment to generators to sit idle is costing ratepayers $5 billion dollars per year. In addition to the economic insanity in the energy file we have the additional incompatibility of the location of many of the industrial wind turbine towers. Industrial Wind Turbines produce infrasound, low frequencies sound, high frequencies sound, amplitude modulation, stray voltage, vibration, and shadow flicker. None of which are addressed in the regulations. They encroach on prime agriculture lands and disturbances to water wells have been reported. During construction and for the lifetime of the operation of all wind facilities wildlife can be harmed, harassed, killed and displaced. The existing regulations regarding acoustic testing and monitoring, when implemented at all, are cumbersome by design, rarely feasible, and statistically dishonest. Not one PC member of parliament voted in favour of the Green Energy Act 2009. You did not perpetuate this disaster upon us. The only honourable approach to addressing the Green Energy Act is to cancel it. 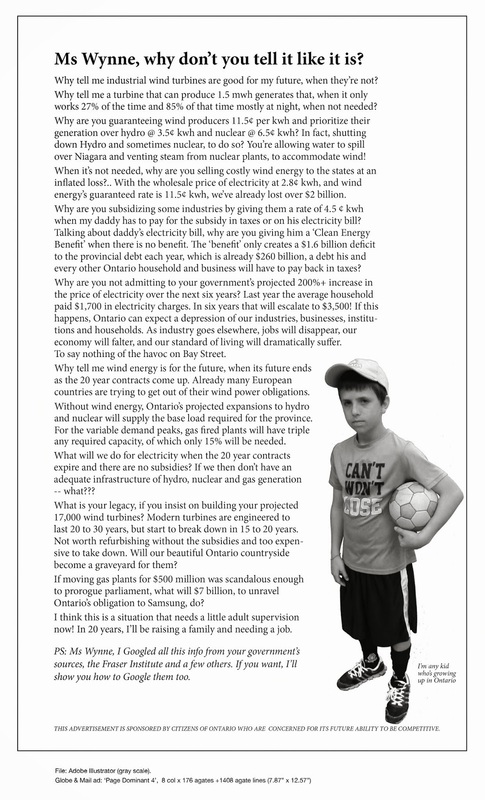 In a Financial Post article entitled “Yes, Ontario’s Liberals can cancel their terrible renewable power contracts—and they should do it now”, (Lawrence Solomon, September 2016) argues for “cancelling Ontario’s odious renewables contracts”. Please bring some financial sanity back to the energy portfolio. Mr Di Matteo on ‘Ontario’s Large Debt Grew in a Hurry’ Ontario’s net provincial debt in 1965 was $1.6 billion dollars. PS: When Dalton McGuinty was elected in Oct 2003 the provincial debt was $138.8 billion dollars. Before he handed us over to Kathleen Wynne in 2013 the provincial debt was $252.8 billion dollars so McGuinty added $114 billion dollars to the provincial debt in his ten-year tenure. By the time Wynne was removed from office this year with a resounding defeat the provincial debt had grown to $315 to $332 billion dollars. So, Wynne added $62 to $79 billion dollars to our provincial debt in her five-year tenure. The liberals added $172 to $193 billion dollars to our provincial debt. A downloading of debt onto the next generation that is unprecedented in Canadian history. As bad as that financial mismanagement is, it does not tell the whole story because you also must add in the total revenue that was spent in the fifteen years that the Liberals were in power. Using the historical budget documents that are available on the Ontario Ministry of Finance website in the 2003-4 budget total revenue was $68.4 billion dollars and total expenses were $73.9 billion dollars so McGuinty ran a $5.5 billion-dollar deficit in his first year in office. Over the next fifteen years revenue doubled to $142 billion dollars in 2017-18, but revenue was never enough to cover the expenses and the provincial debt just kept piling up. The total revenue that was spent from 2003 to 2018 is $1,558.37 billion dollars or $1.558 trillion dollars! Plus, you need to add in the provincial debt accumulated over this time, so the Liberal government of Ontario spent $1.751 trillion dollars while in office. These are mighty big numbers but somehow, I do not feel richer for it as our infrastructure crumbles, and we get hallway health care. With concerns still being raised about the potential impact of turbines on well water, the provincial government is planning to follow through with a health-hazard investigation, says an area MPP and minister. Lambton-Kent-Middlesex MPP and Infrastructure Minister Monte McNaughton said the Progressive Conservatives will “absolutely” honour their election pledge. Water Wells First, a grassroots group, began raising concerns two years ago about the potential impact the construction of the North Kent Wind farm would have on water wells due to Kettle Point black shale geology and the shallow aquifer in the area. Since then, more than 20 water wells have reported significant amounts of sediments that have clogged up the flow of water during construction and after operation of the wind farm began. The group says this particular shale is known to contain metals such as uranium, arsenic and lead that are harmful to human health. “ONE LETTER issued to me in response to the two letters I had written to the Ministry of environment in Ontario, required immense resources in another attempt to shut me down. A recent (partially released) FOI showed: TWENTY-ONE (21) employees at the ministry of environment and the attorney generals office were involved to create a single response to a resident of Ontario. The email chain began in October of 2017 and I received a response March 1, 2018. This is a brilliant example of the duplication and redundancy required when no one is responsible for anything and everyone just passes the buck or in this case the piece of paper. Plausible deniability and not assuming responsibility has always been their game. It’s was the long weekend and a statutory holiday in Ontario, yet crews were out working on a tied down turbine in Haldimand County. Never ending. It is always something with these intrusive monster machines.